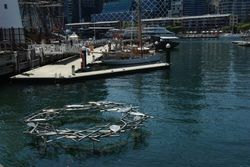 An art installation by leading Australian light artist Warren Langley was unveiled at the Australian National Maritime Museum to commemorate the disappearance of submarine HMAS AE1 and the loss of its 35 souls during World War One. The work entitled ‘… the ocean bed their tomb’ takes the form of a large scale stainless steel wreath, six metres in diameter floating above the water in the museum basin, casting a shadow from day to night. The concept for the work of art arose from the mysterious circumstances of the submarine’s disappearance, the necessarily truncated effort to search for it given the exigencies of wartime operations and the chimera or elusive shadow it leaves, in that neither the submarine nor the bodies of the men on board have been found. 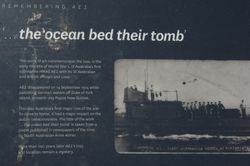 The loss and this unresolved mystery, amplified by a line from a poem (‘… the ocean bed their tomb’) written at the time by South Australian Anne Almer, inspired Warren Langley to conceive the work in a lyrical homage to the lost sailors. HMAS AE1 was an E-class submarine of the Royal Australian Navy (RAN). She was the first submarine to serve in the RAN, and was lost at sea with all hands near East New Britain, Papua New Guinea, on 14 September 1914, after less than seven months in service. The wreck of the submarine has never been found, despite several searches. The disappearance was Australia's first major loss of World War One. 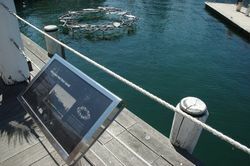 This work of art commemorates the loss, in the early months of World War 1, of Australia's first submarine HMAS AE1 with its 35 Australian and British officers and crew. AE1 disappeared on 14 September 1914 while patrolling German waters off Duke of York Island, present -day Papua New Guinea. This was Australia`s first major loss of the war. So close to home it had a major impact on the public consciousness. 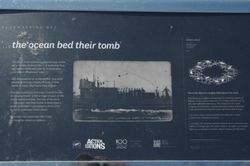 The title of the work '...the ocean bed their tomb' is taken from a poem published in newspapers of the time by South Australian Anne Almer. More than 100 years later AE1's loss and location remain a mystery. 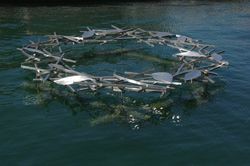 A burial at sea is often accompanied by a floating wreath of flowers. In 1914, early in the war, it is unlikely that the men of AE1 were afforded that luxury. 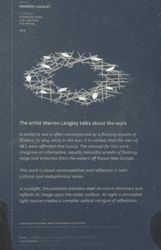 The concept for this work imagines an alternative, equally beautiful wreath of floating twigs and branches from the waters off Papua New Guinea. This work is about contemplation and reflection in both a literal and metaphorical sense. In sunlight, the polished stainless steel structure shimmers and reflects its image upon the water surface. At night a concealed light source creates a complex optical intrigue of reflections.